The last straw. That sums up the reason parents find it difficult to stay calm. The sibling fight. The last straw. The whining in the store. The last straw. The temper tantrum. The last straw. And the list goes on and on and on. Parenting is filled with last straw moments that push stressed and overworked parents over the edge. Through self care and mindful parenting, those last straw moments will become only memories. Take care of yourself. First and foremost, you can't be a calm parent if you live a stressed and hectic life without any time for yourself. What do you do for fun? Do you have time to enjoy some of your favorite activities? Make sure that you make time for yourself. Exercise is a great stress reliever. Take time to get physical. Join a health club, yoga class, ride your bike or go for a walk. Also, make time to connect with other adults (without your kids). Have coffee with a good friend, take a class, or get out with a running buddy. Sometimes, just talking with another adult is enough to help us destress. And don't forget to laugh a lot! Also, find time for solitude. Take a solo walk. Create an "escape space" in your home. Sneak out and get an ice cream cone...all by yourself! Here are some additional stress reducing suggesions. Set up clear consequences. Many times, parents visit these last straw moments because they don't have any behavior system in place. Instead of calmly stating a consequence or giving the child a chance to improve for a mark on his behavior chart, parents blow up because it's the only option. When kids know what the consequences are and hear you calmly remind them, there is less chance for bad behavior to get out of hand. Have a family meeting and list the behaviors that are absolutely not o.k. in your home. Older kids can help decide on the consequences. Post the list of consequences in a place where all can view them, and if you need to, have a paper copy or cell phone copy to carry with you. Use behavior charts or behavior contracts to reward positive behavior. Focus on one or two behaviors at a time and work on them until they are under control. The rewards will depend on the ages of your kids. Don't expect perfection, because this can also lead to frustrated parents. Be realistic. For instance, If your kids mark their charts 4 days out of 7, they can get a reward. You can increase the number of days as they make better choices with their behavior. Keep the lines of communication open. Be available and willing to talk with your child. Make observations about his behavior and open up communication about what you notice. In addition to behavior, talk about all things. Check in about school, friends, chores, current movies. The more you communicate and understand your child's world, the more compassionate you'll feel toward your child and the more prepared you'll be if he misbehaves. Avoid negative criticism. Don't criticize. Preteens and teens are especially sensitive. They tend to be critical of themselves as it is, and they don't need a parent throwing critical remarks at them. Be accepting, loving, and supportive of your child. Praise your child when she/he is behaving well. Let your child know when she is doing a great job! Kids respond wonderfully to praise. And parents have a habit of getting so caught up in negative behaviors that they forget the basic concept of praise. Kids will often try to repeat positive behaviors when they are rewarded with praise. Most important, practice acceptance. Life isn't easy. Some days are more difficult than others. And sometimes, kids have habits or ways of behaving in the world that drive us crazy. Learn to accept your child for the wonderful person he/she is. You can't make him less sensitive to textures. You can't make her less picky when she eats. 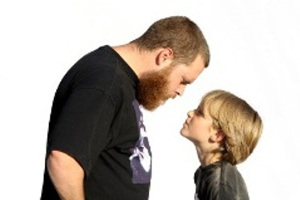 Accept your child with all of his challenging behaviors instead of trying to change him. And learn to go with the flow as best you can. Some days the current will take you, and it's easier to let it than to fight it!